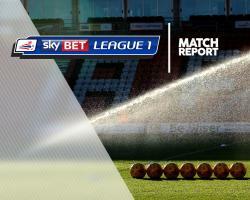 Swindon 3-0 Shrewsbury- Match Report - Swindon Town MAD! A Nicky Ajose brace saw Swindon earn only their second win in 12 games as they beat Shrewsbury 3-0 at the County Ground. Ajose drilled the resulting spot-kick into the roof of the net. Ellis Iandolo came close to doubling the lead three minutes after the restart, his half-volley from the edge of the box hitting the goalkeeper's left post. The midfielder turned creator seconds later, laying the ball off to Ajose, who turned and slotted the ball beyond Callum Burton and into the bottom corner for his 25th goal of the season. Jean-Louis Akpa Akpro played a wonderful through-ball to substitute Larnell Cole, but 17-year-old Will Henry was able to block the shot with his outstretched leg. Second-half sub Jordan Young, 16, completed the win with four minutes remaining as he received the ball in the centre of the box and coolly placed it beyond Burton for his first Robins goal.